Republican Eric Linder currently represents Assembly District 60 and will not be termed out until 2024. Linder is expected to win re-election in 2016; however, a well funded and well known Democrat could compete for this seat due to a close split in voter registration. Assemblyman Eric Linder is a small business owner, a husband, and a father and resides in Corona, California. 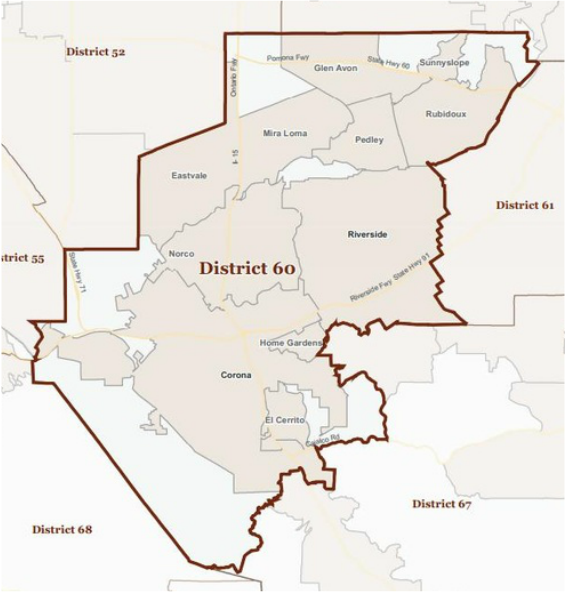 Elected to the California State Assembly in 2012, Eric currently represents California’s 60th Assembly district which encompasses the cities of Corona, Eastvale, Jurupa Valley, Norco and Riverside. For almost twenty years, Eric has worked in real estate, helping find ways to incorporate technology into the industry. He has spent years helping people get the home of their dreams. But as the market turned in the Inland Empire and real estate began struggling, Eric took his technology background and founded an online communications firm, eMotiv Marketing. In fact, Eric’s firm built the websites for several Members of the Assembly Republican Caucus. Eric previously owned and operated an aircraft rental and chartering company. This wealth of business experience has given Eric an appreciation for the damage that high taxes and over-regulation can have on small businesses that struggle enough just to get by. Eric has also been a longtime champion against government waste. He was one of the Founders of the Corona Taxpayers Association, and has been part of business groups throughout Southern California for years. The son of a Mexican immigrant father, family has always been important to Eric. In fact, Eric is raising his family in the same area he grew up in. Eric lives in Corona with his wife and three children. He attended Highland Elementary and Norco High, which are both in the District, while his oldest daughter is an alumnae of Santiago High School and now attends California Baptist University. Eric has helped coach his kids’ soccer and softball teams, and is a regular rodeo attendee. Currently, Assemblyman Linder serves as the Vice-Chairman of the influential Assembly Committee on Transportation, while also serving on other key policy committees including Appropriations, Higher Education, Banking and Finance, and Jobs, Economic Development & the Economy.